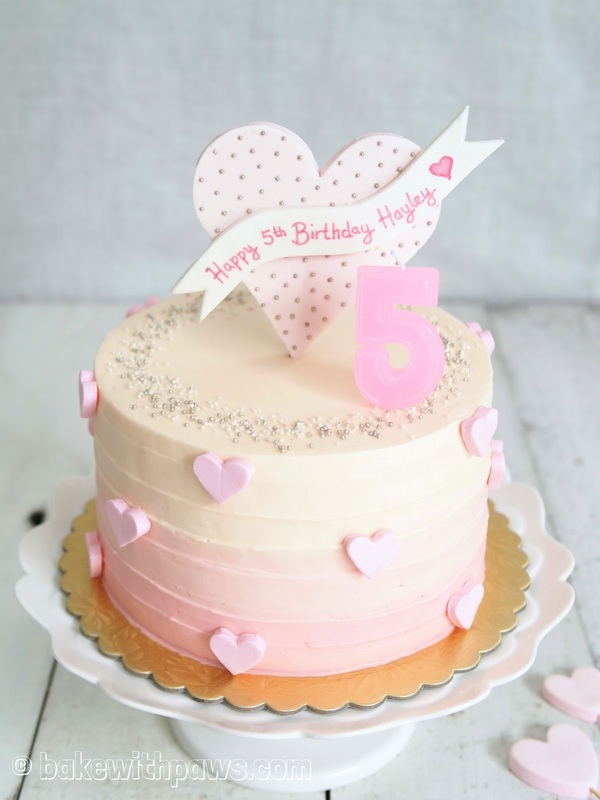 This birthday cake was ordered by a young mummy for her lovely daughter’s 5th Birthday. Thank you to her for having the confidence to order it even though she doesn’t know me personally. She messaged me later that her daughter was jumping up and down with delight when she saw her cake and that the whole family loved it. I am so encouraged to hear this positive feedback. Shift flour, salt and baking powder. Set aside. 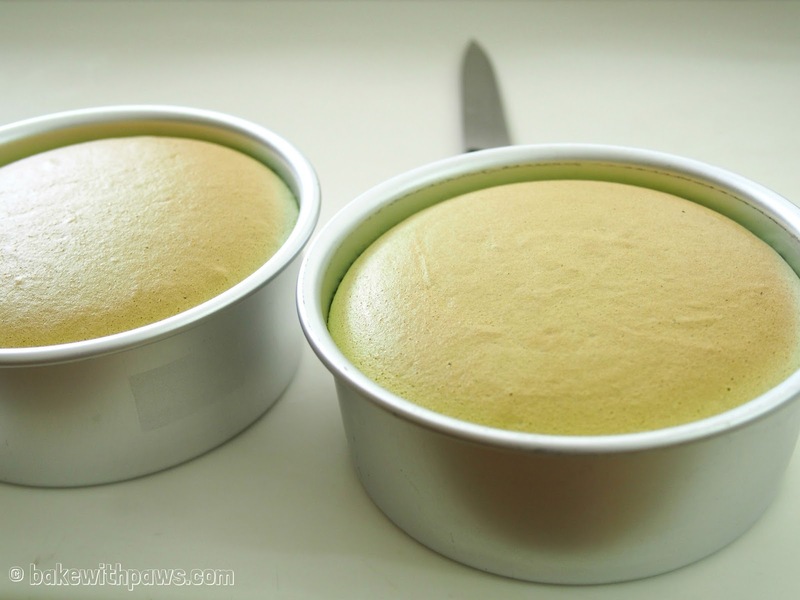 Combine fresh milk and pandan paste. Set aside. Heat corn oil in sauce pan over low heat then add in the shifted flour mixture and mix well. Remove from heat and transfer to a mixing bowl. Then add in milk and pandan mixture, mix with spatula until all incorporated. Gradually add in the egg yolk, stirring with a spatula or hand whisk until smooth. Set aside. Using an electric mixer, whisk egg white until frothy before adding cream of tartar and continue to beat until foamy. Gradually add in sugar and whisk until firm peaks formed (firm peaks is between soft peaks and stiff peaks). Mix 1/3 of meringue with yolk batter with a spatula. Add another 1/3 portion and fold gently. Then pour in balance of meringue. Fold gently using a spatula until well incorporated. Pour the batter into the 2 prepared round tin and tap tin lightly to remove air bubbles. Baked in water bath at 170C for 30 to 35 minutes. Then another 40 minutes at 150C. Remove from the oven and drop the pan at a height of 10 cm onto a table top. This will prevent cake from sinking. Unmould as soon as you can. To remove the cake from the pan, run a thin-bladed knife around the inside of the pan and invert the cake on non-stick baking paper. Peel off baking paper from the base and re-invert onto a rack to cool. You can also invert the cake and let it cool completely before removing the cake tin. Cut the butter into cubes. Set aside to room temperature. Combine egg white and sugar in a heat-proof bowl over a pot of simmering water. Make sure the base of the bowl is not touching the water. Whisk with hand whisk until the sugar is dissolved. Rub between your fingers to check if there is any unmelted sugar. Transfer the egg white mixture to a bowl of mixer. With whisk attachment, beat over high speed until stiff peaks. Let it cool to room temperature before adding butter, this will prevent the butter from melting. To speed up the process, you may leave the meringue in refrigerator. At low speed, add in the butter cube gradually then turn to high speed. Beat until the mixture comes together. Scrap the bowl if necessary. At one stage, it will look curdled, but keep on beating until it combines into a smooth buttercream. Add in salt and vanilla extract until well incorporated. Tools: Cake board, cake turntable, off-set spatula, icing smoother, piping bags and round tip nozzle. Cut the dome off from the cake if necessary and place on a cake board. Place the cake on turntable. Spread a layer of Swiss Meringue Buttercream (SMB) on top of the cake. Then stake the second cake on top. Crumb coat the entire cake and leave in the fridge for 10 to 15 minutes. You may also slice each cake into two to get the total 4 layers of cake. To make SMB into ombre colors - Divide the balance of buttercream to three portions. Tint buttercream to 3 difference shades of pink (light to darkest). 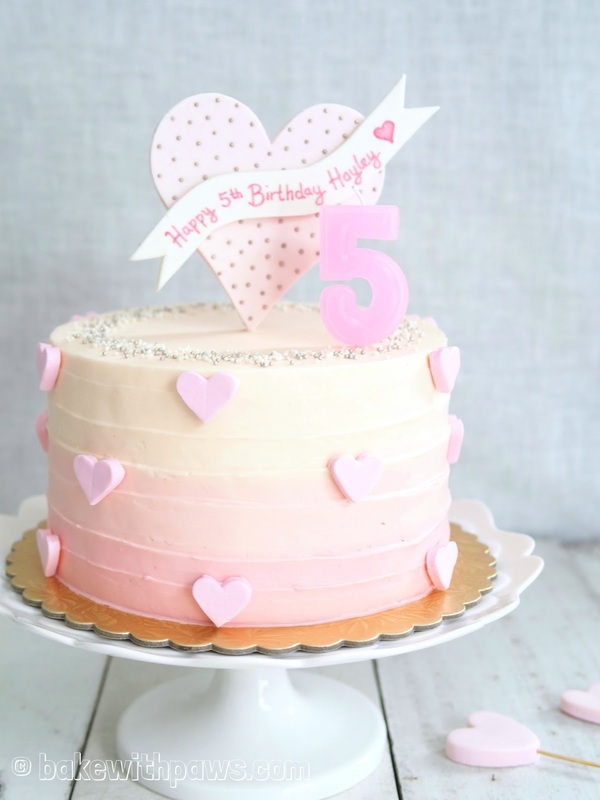 The lightest pink should have more buttercream as it needs to cover the top as well. Place darkest shade of pink buttercream in a piping bag fitted with a plain round tip. Pipe rings around the cake starting from the bottom around 2 rings for each color. Change to light shade of pink and pipe another two rings. Then very light shade of pink for the last two rings and top. Once finished piping all colors, use an off-set spatula to smooth the top. Then smooth the excess icing at side of the cake too. Even out the icing at the side with an icing smoother by placing the smoother lightly on the cake with bottom touching the turntable and spin the turntable around. Repeat few times until the icing is smooth and even. Smooth the top again with the same off-set spatula until even. You may create the ribbon effect by holding the tip of the spatula sideways against the icing and start from the bottom. Press gently and spin the turntable while dragging the spatula until finish the side of the cake. You may decorate with any edible pearls as you wish. Hi... if I'm using pandan essence to replace the 66g of pandan juice, should the juice be replaced with milk instead? Tx! If I'm using pandan essence, how should I replace the 66g pandan juice? Need to sub it with milk instead? Please use the below recipe is you want to bake in 6 inch cake pan. This recipe will yield two 6 inch round cakes. 50g homemade pandan juice (screw-pine leaves juice), very thick and concentrated juice. Please refer above.